After the August recess, Congress is expected to vote on a bill to facilitate the export of U.S. crude oil to overseas refineries. If approved, the proposal would reverse a longstanding policy that requires American oil to be refined in U.S. or Canadian refineries before being sold on the international market. For more than four decades, policymakers have relied on the current export policy to help insulate the U.S. economy from supply disruptions and oil embargoes. Congressional haste to allow more U.S. crude oil exports creates a risk of fundamental policy change without adequate consideration of its consequences. Broadly, by facilitating more U.S. crude oil exports, Congress would be abandoning the national goal of American energy independence—a goal that politicians from both parties and oil industry leaders have been urging Americans to embrace for the past 50 years. Recent public opinion research commissioned by CAP found that Americans are hesitant to abandon the pursuit of greater energy independence and are deeply skeptical of proposals to increase U.S. crude oil exports. In a national survey of more than 1,100 voters, 7 in 10 respondents said they oppose allowing oil and gas companies to export more U.S. oil and gas to foreign countries, including 61 percent of Republicans, 69 percent of independents, and 75 percent of Democrats. On a practical level, the economic, national security, and environmental impacts of changing long-standing U.S. crude oil policy are neither well-documented nor well-understood. A 2014 report by CAP found a high level of uncertainty about the effects of increased oil exports on U.S. consumers, noting that after restrictions on Alaskan crude oil exports were lifted in 1996, California gasoline prices increased from 5 cents above the national average to 15 cents above the national average. Reams of freshly minted studies from oil producers, however, aim to demonstrate that the impact on U.S. consumers would be minimal. These same studies show that the biggest beneficiaries would be oil producers that would increase their drilling activity to meet new foreign demand. On the other hand, many oil refiners argue that the U.S. refinery sector is capable of absorbing any new supply, making it unnecessary to lift export restrictions to balance the market. The AFL-CIO has expressed concern that lifting the export ban would scuttle plans to invest in and expand U.S. refining infrastructure. The United Steelworkers union has communicated similar concerns to Congress. According to a recent study by the Energy Information Administration, or EIA, allowing more crude oil exports could result in $8.7 billion less investment in U.S. refining capacity over the next 10 years. The lack of precise, independent, and credible estimates of the market and production effects of allowing more U.S. crude oil exports makes it difficult to predict the proposal’s full environmental costs. 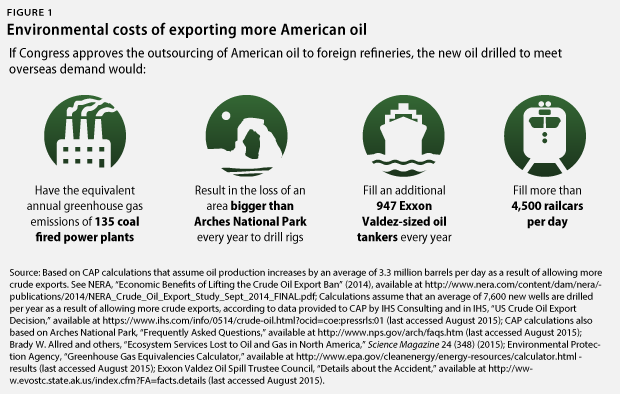 Yet, it is imperative that Congress analyze and understand these costs if it is to fully and fairly debate potential changes to U.S. crude oil export policy. This column briefly introduces three categories of environmental costs that Congress should investigate more thoroughly as it considers U.S. crude oil export policy: U.S. land loss; carbon pollution; and production and transportation risks. These preliminary estimates are based on the Center for American Progress’ review of three studies. Two of the studies were commissioned by the oil industry: an analysis by ICF International on behalf of the American Petroleum Institute, published in March 2014, and a report funded by a coalition of oil companies and released in May 2014 by IHS CERA. The third study, conducted by National Economic Research Associates, or NERA, Consulting and published in September 2014, was commissioned by the Brookings Institution, which is a vocal advocate for U.S. crude oil exports. Each of the three industry-oriented studies that CAP reviewed predicts that U.S. oil production would increase if the United States exports more crude oil. If these predictions are accurate, increasing production to meet the demands of foreign consumers will result in the loss of open lands and wildlife habitat as the industry builds new wells, well pads, and roads. The question for Congress is by how much? According to data from IHS CERA’s study that was provided to CAP, oil companies would drill an average of 26,385 new oil wells in the United States every year between 2016 and 2030 if the crude oil export ban is lifted, or approximately 7,600 more wells on average per year than if the ban remains in place. These new wells could leave a significant footprint. According to a new study published in Science Magazine, the drilling of an average of 50,000 new oil and gas wells per year in North America between 2000 and 2012 resulted in approximately 11,600 square miles of land being developed and occupied by well pads, roads, and storage facilities. If these development patterns continue, IHS CERA’s forecasts of new drilling activity suggest that increased oil exports would alone result in the loss of as much as 2,054 square miles of land between 2016 and 2030, or an area larger than the state of Delaware. 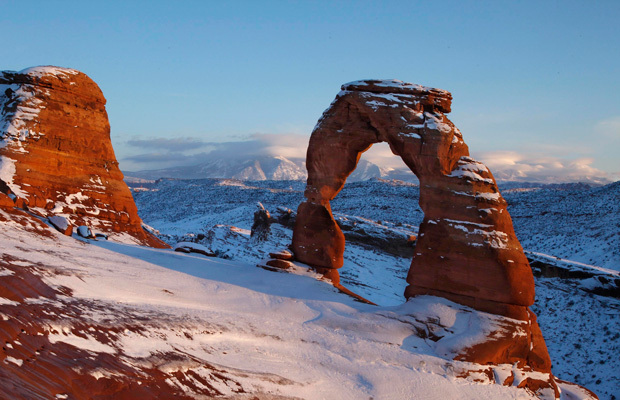 This means the United States would lose approximately 137 square miles of land to oil infrastructure per year, or an area larger than Arches National Park in Utah, simply to feed foreign demand for U.S. crude oil. Because drilling would be spread over broad landscapes, its infrastructure would disrupt not only the land on which wells and roads are built, but also the areas around it; access roads for drilling, for example, can impede wildlife migration and fragment surrounding wildlife habitat. Policymakers also need to understand the extent to which expanded crude oil exports will add to U.S. and global greenhouse gas emissions. Given the urgent threat posed by unmitigated climate change, Congress should not make energy policy choices without considering the potential climate impacts of those choices. According to the EPA, the combustion of a barrel of crude oil results in approximately 0.43 metric tons of carbon pollution. If U.S. production increases by an average of 3.3 million barrels per day between 2015 and 2035—the high range from the NERA report and the highest estimate in the reports CAP reviewed—then the combustion of those resources will result in more than 515 million metric tons of carbon pollution per year. That is the equivalent annual emissions of 108 million passenger cars or 135 coal-fired power plants. It is unclear the extent to which more exports of U.S. crude will encourage additional oil consumption and, therefore, add new carbon pollution to the atmosphere. The NERA report concludes that the “additional supply of U.S. crude oil in the world market will lead to a reduction in world oil prices” unless the Organization of Petroleum Exporting Countries, or OPEC, “cuts back exports sufficiently to fully offset the increase in U.S. exports.” If prices do in fact drop, then we can expect consumption—and therefore carbon pollution—to increase. It is also important to note the greenhouse gas impacts of the oil production process. Most onshore oil wells co-produce methane, a potent greenhouse gas. If an oil producer is unwilling or unable to capture this methane, the producer will either vent the methane into the atmosphere or burn it as wasted gas. As a result, significant new oil production could increase methane and carbon pollution if those emissions remain uncontrolled. The reports that CAP reviewed predict that new crude oil production resulting from increased oil exports would largely be light sweet crude that is produced through hydraulic fracturing techniques in tight oil formations. Light sweet crude from the Bakken formation in North Dakota has proven to be among the most volatile and dangerous types of oil that is shipped. In February 2015, for example, a train carrying Bakken crude oil derailed and exploded in West Virginia, forcing nearby residents to evacuate. Investigators found that the crude oil onboard the train contained high levels of combustible gases. If production indeed increases by an average of 3.3 million barrels per day from 2015 to 2035 as a result of increased oil exports, that is enough oil to fill more than 4,500 additional railcars per day. If all that oil were shipped to overseas markets, it would fill 947 Exxon Valdez-sized oil tankers per year. The environmental impacts of increasing U.S. oil exports can affect the global environment, as well. Outsourcing U.S. refining capacity to countries with weaker environmental safeguards, for example, could result in additional air and water pollution in those countries and globally. In addition, if increased U.S. crude oil exports indeed lower international oil prices, as oil producers argue, these lower prices would disincentivize or slow the transition to cleaner and renewable fuel supplies around the world. The potential environmental impacts of facilitating more U.S. crude oil exports are far-reaching and costly and would affect communities in the United States and around the world. Lawmakers should gain a better grasp of these consequences before rushing ahead with a decision that would have such profound effects on U.S. energy, economic, and environmental policy. Matt Lee-Ashley is a Senior Fellow and Director of the Public Lands Project at the Center for American Progress. Alison Cassady is Director of Domestic Energy Policy at the Center for American Progress.